Despite living in France nearly five years, I must confess that I still, frequently, grocery shop like an American. That is to say that I buy enough for the week (or weeks) ahead in pretty big quantities. Then I have to figure out where to put it all in my French-sized fridge, cabinetry, and shelving. But, like most Parisians, I have no car. 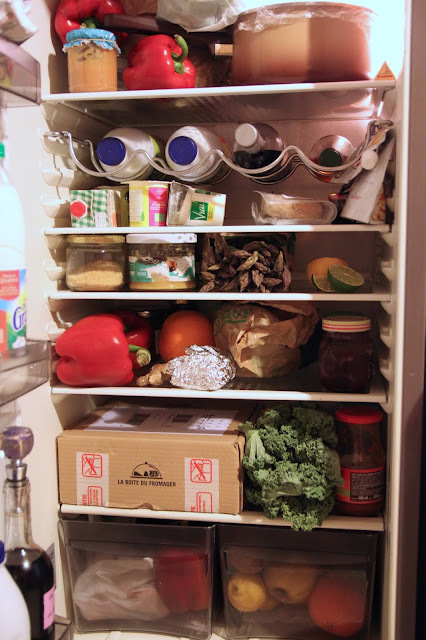 So how is a person (and a tiny one at that) supposed to get all those groceries home? There is always my trusty caddy, which is worn and torn but still rolling. But the problem here is that it can only carry a limited amount, and also that it gets quite heavy when really stuffed full. At first, that is me you see, trudging through the streets of Paris with my caddy (in better shape five years ago), bags hanging off my arms, an ugly backpack on my back. It is not fun, and not pretty. The girls originally think my caddy makes me look like an old lady, but once we all get used to Paris, we realize this is just how people cart things around, without cars. Here is a young guy picking up firewood. Really anything can go through the streets on a caddy. But after a year of schlepping my own groceries home over the bumpy cobblestone streets, suddenly, the angels sing and I understand French well enough to know that the sign over that particular check-out lane in the grocery store says "livraisons" ("deliveries"). It turns out, I've been a sucker: I can go through the checkout lane with truly obscene amounts of groceries, and let them do the schlepping for me, for free. So now, when shopping in the delivery lane, I particularly like to stock up on heavy, unwieldy, non-perishables: UHT emergency milks and soy/almond milks, canned goods, baking needs, bulky cereal boxes, all the toilet paper a person could dream about. Bring on the watermelons! I unload it all at the checkout lane, sign a form with my address on it (and digicode and phone number, along with what floor I live on and whether or not I have an elevator), and they bag it up and deliver it anywhere from half an hour (time for you to walk back home) to three hours. Only once in almost five years have they gone past three hours, and they're always friendly, polite, and efficient. "Where shall I put the bags, Madame?" They won't actually unload the bags for you, but they'll walk them straight to your kitchen counters. The higher end, big grocery stores (big for Paris, that is), like my favorite -- Monoprix -- have a decent selection of organic stuff, from flours and drinks and cans to fruits and veggies. But I still prefer to buy my fruits and veggies at the local outdoor market (how French of me) in enormous bulk (how American of me). I usually stock up -- in my caddy -- with enough for a whole week, and we are such a produce-loving family that I'm one of the big customers at my favorite organic produce stand. If there appear to be red peppers everywhere in our fridge, that's because there are red peppers everywhere in our fridge. Pippa is addicted to them, and we can't fit them all, or most of our fruits and veggies, in the produce drawers. Once, I show up to my favorite produce stand after having not bought anything for a couple weeks in the middle of the freezing winter and explain I've been absent because I've been sick. They exclaim sincerely, "Next time just call us! You can order over the phone and we'll bring it to you!" So, the next time I really am sick and it's freezing rain out, I call in my order. Sure enough, a hundred euros worth of fantastic, organic fruits and veggies show up at my apartment. Ding-dong, the eggplant is here! I don't abuse the privilege, because I usually enjoy going to the market, but it's nice to know they'll deliver if necessary. It's one of the perks of becoming a local. And speaking of perks, today I receive the mother load of all perks, the ultimate delivery, a big box of....wait for it...if you've been paying attention for the past 500+ posts, you might see what's coming here.....cheese! Some very clever people have come up with a gourmet cheese delivery service right to my door called, aptly, "La Boite du Fromager" (literally "The Cheesemonger's Box"). Have I ever received such an exciting package? Rarely. Have I ever received such a stinky package? Never! I hear my doorbell ring, and before I can even open the door, I already know my cheese delivery has arrived from the cartoon-like cheese-smell rays wafting under my door. The lovely people at La Boite du Fromager have carefully included not only a refrigerator pack and insulated packaging (even my delicate goat cheese arrives in perfect shape), they've also included handy information sheets. I thought grocery delivery was fantastic. And fresh produce delivery made me feel special. But this is just a whole other level of exciting. Cheese -- straight to my door! It's like a gift from heaven, cheese heaven. Crémeux d'Ossau sounds like it would be some version of Ossau Iraty, but the similarity ends with the name. The cheese, whose name means, roughly, "Creamy One from Ossau" is from the same region as the much-more famous Ossau Iraty, the Ossau valley in the Pyrénées Atlantiques, which explains the Ossau in both names. While Ossau Iraty is a sheep cheese, the Crémeux d'Ossau is made from raw cows' milk, pressed and not cooked (referred to, in French, as "pâte pressée non cuite"). This cheese is only made between June and September, at an altitude of 1km. That makes it's a summer-grazing cheese, where the cattle munch happily in the green pastures. That tends to make the milk creamier, the final cheese a little more golden in color, and the flavor laced with herbal and floral notes. But don't expect subtle grassy notes in the Crémeux d'Ossau. The crust alone should alert you to the general stink-level: orange and brown, rough and bumpy. It's a strong cheese that smells and tastes like a flannel shirt you've worn by a campfire, but not for too long or too close, and I mean that in the best possible way. It's an unexpected, unusual cheese and a real crowd favorite. Crémeux d'Ossau is named not just for its terroire but also for its texture -- creamy, indeed. It's a semi-hard cheese but one that just melts in the mouth. My information sheet tells me it would pair well with a glass of red Gaillac or white Jurançon, and that it would also go well in a creamy risotto, although I can tell you that I'd rather just eat mine on a piece of baguette (though I wouldn't complain about the wine). One of the cheeses in my Boite du Fromager is this Crémeux d'Ossau. The cheese is excellently curated -- chosen, aged, and shipped. 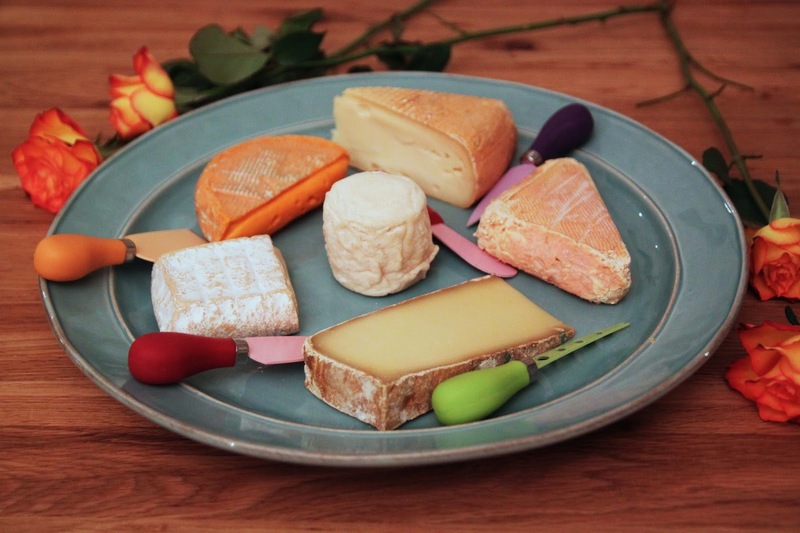 It comes with an information sheet, and photo, which explains all about the cheese, including wine pairing and recipe suggestions. My Lord -- not only did they ship gourmet cheese directly to my door, they've even done my research for me! Now if only I could get somebody from a local boulangerie to bring some bread straight to my door.